To save to your computer, right click on the link and choose “Save Link As” or “Save Target As”. Copyright and usage: Please note the logos below are copyrighted by the Emporia Convention & Visitors Bureau (CVB). The Emporia CVB logo must be used in all marketing materials for any events or meetings that the CVB sponsors. 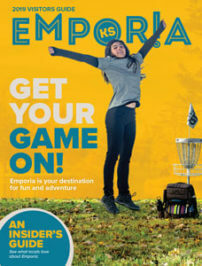 Logos may also be used for editorial content about tourism in the Emporia area, or editorial content about the Emporia CVB. Logos MAY NOT be altered in any way, in whole or in part. The links below will open Dropbox. Click the download button near the upper right. Videos may be used for marketing or editorial content regarding tourism in the Emporia area.